Designed for industrial and commercial uses, Highflo offers superior drainage for larger roof areas. 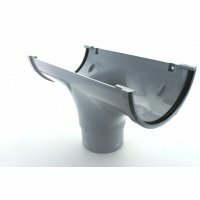 Extra strong support brackets help to withstand heavy snow loading and wind updraft likely on exposed or remote buildings. 2 or 3 screw fixing. Fix at 1m centres maximumDesigned for commercial and industrial uses, Highflo o..